Replacing multiple windows in your home is a worthwhile, but costly, investment. As you vet and select the best window contractor for your project, it is important to discuss your budget and potential factors that might affect the overall cost of your window replacement. To make sure your project is as affordable as possible, review these hidden costs ahead of your upcoming window replacement. Ahead of your window installation, it is important to discuss how to best dispose of your old windows. While many window installers will clean up and discard the windows at no additional cost, some contractors do charge a fee for this service. Check your estimate, and discuss disposal details as you vet contractors. The cost of transporting the leftover frames and dump fees for non-hazardous waste disposal can add an extra $40 or $50 to your budget. Start your window replacement project today. Most new windows will easily slide into your existing window openings, making for a relatively simple replacement process. However, there are some situations —like uneven framing or rotting wood— that can cause pricey complications. If your new windows won’t fit in the existing space, the frame may need to be rebuilt to accommodate the new windows. If you’ve had moisture damage from a recent storm, the water might leak into the wall. The original window will need to be removed in order the replace the damaged or rotted window. This is more common in older homes. Homeowners may be unaware of this damage until after the window has been removed. In many cases with older homes, the wall structure may have broken seal damage, and not the window itself. This damage to the wall won’t be visible until the window is removed. There is a fire code. Homes older than 75 years old were likely not built to modern fire code standards. The International Residential Code dictates that windows must have a specific opening size (with a minimum of 24 inches height). If your home’s windows don’t adhere to these requirements, they will likely need to be enlarged to comply with these standards. Rebuilding a window frame can cost an additional 50 percent on top of your current replacement costs. While rotted or severely damaged frames are usually a worst-case scenario, talk to your contractor about what damage they may encounter once the window installation is underway. If you purchase your windows from a home improvement store and haul them home, you do not need to worry about a delivery charge. However, if you purchase your windows from a dealer or manufacturer, you may have a delivery fee. Depending on your region and distance from the seller, the delivery fee can range anywhere from $50 to $400. If you are purchasing your windows through a dealer or contractor, discuss if your contractor will cover this fee. If not, discuss out how much it will cost, as it will be included in your estimate. Begin your window replacement: Find trusted contractors in your area. In most cases, a home window replacement is a process between the homeowner and contractor. In some instances, a project may require a building permit before you can begin your project. 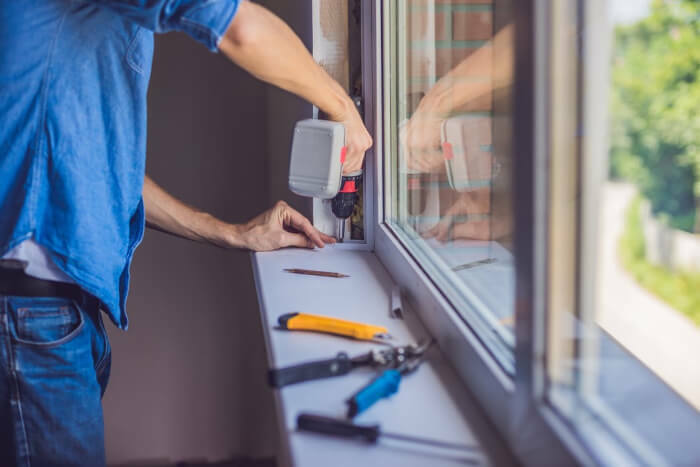 A permit is required when a window opening is enlarged horizontally or when the wall structure is altered, as both of these changes can have safety repercussions. An application must be submitted and a permit approved before any construction begins. While homeowners are responsible for acquiring permits, many contractors will take on the task. It is important to discuss any permit needs with your contractor, as the average cost of a building permit can run anywhere from $400 to $1600. If your home was built before 1978, your walls are likely coated in lead-based paint. Undisturbed, lead-based paint does not pose many risks. However, renovations and repairs can create toxic lead dust. Paint lead and lead-contaminated dust are some of the leading causes of lead poisoning. Windows carry a higher lead exposure risk due to their exposure to outside elements and paint friction. If you have an older home, you or your contractor will need to inspect your paint. Testing for toxic lead typically costs between $200 and $400. You may need multiple tests. While homeowners can conduct a home inspection for an affordable price— if the test is positive, a lead risk assessor may need to examine the home and send dust samples to a laboratory for analysis. If you have an older home, talk with your contractor about testing for lead-based paint and how it could impact the cost of your window replacement project. Ready to find a trusted contractor for your window replacement? The Modernize Contractor Checklist will help you vet a trusted contractor, so you can relax knowing your window repair or replacement project is in good hands. You can access the interactive checklist by visiting the Modernize Homeowner Portal or by downloading it here.